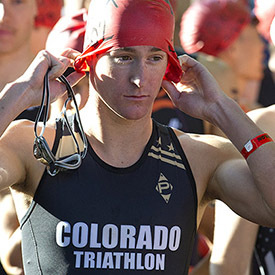 COLORADO SPRINGS, Colo. — USA Triathlon today announced its first-ever Collegiate Club National Poll, a list of the top-10 collegiate club triathlon teams — men’s and women’s combined — in the country based on a vote of leaders from registered collegiate clubs. Voting will occur each year on a monthly basis from January through April. All 147 registered USA Triathlon collegiate clubs are invited to participate in voting each month. In the first voting cycle, which took place in early February, leaders from 32 collegiate clubs weighed in by submitting their top-10 picks in order. Each first-place vote received 10 points, each ninth-place vote earned nine points, et cetera, and the school with the highest point total earned the No. 1 spot. The standings are meant to reflect each team’s overall strength and its potential to reach the combined men’s and women’s team podium at the USA Triathlon Collegiate Club National Championships. After the first vote, eight-time defending national champions the University of Colorado at Boulder earned the No. 1 ranking with 197 points out of a possible 320. The U.S. Naval Academy (142), runners-up for the combined team title in 2017, took the No. 2 position, while the third-place team at last year’s National Championships, the University of California, Berkeley (102), rounded out the top three. The poll provides an opportunity for schools across USA Triathlon’s 10 Collegiate Club Conferences to compare performances and team potential prior to meeting annually at the USA Triathlon Collegiate Club National Championships. Updated standings following each monthly voting cycle will be available at usatriathlon.org. Last year at the USA Triathlon Collegiate Club National Championships in Tuscaloosa, Alabama, 111 collegiate clubs competed for team and individual titles. The 2018 National Championships return to Tuscaloosa from April 27-28. For more information about collegiate club triathlon, click here or email Welk at Jessica.Welk@usatriathlon.org.